Can be loaded from all sides. Data theft is reliably prevented. Fine manufacturing techniques. Handmade according to tradition in a German leather factory. Striking bison leather. Ingenious four-compartment insert system. A lot of storage in the smallest format. 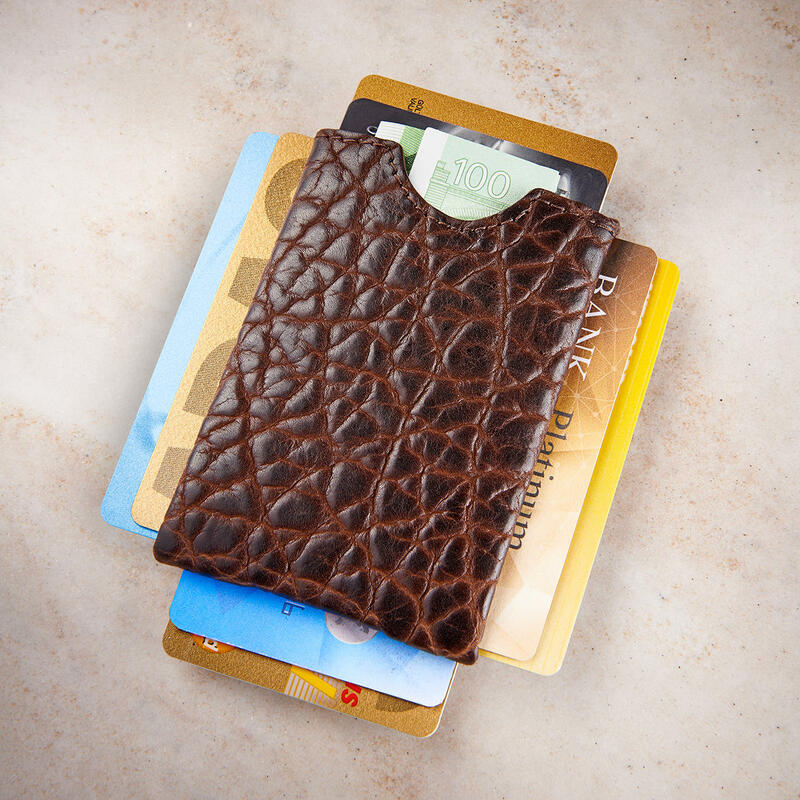 The precious handcrafted wallet holds up to 8 cards/badges. With integrated RFID readout protection. 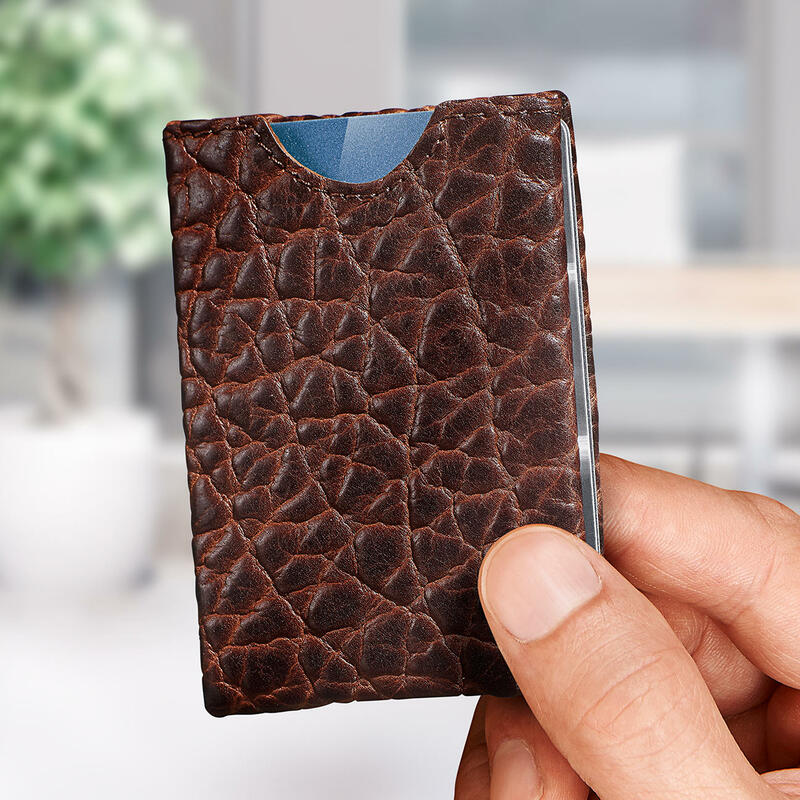 Hardly larger than a credit card, this leather case fits in any shirt pocket. Also ideal to carry along in your jeans or suit. Credit cards, personal ID, driver’s license, etc. you can have your important items on you securely and discretely, even in tight-fitting clothing. Each of the custom-fit compartments on the four pages holds a maximum of two cards/badges. After a short time in use, cards can be removed easily even in the tight-fitted slipcases. A finger recess provides convenient access to the most-used cards. Tension-closing openings let nothing fall out. Sewn in film developed in Germany prevents stealing of your data with RFID readers. Exceptionally robust due to being made of strong bison leather. Its striking grained texture gives it a distinctive look and makes the leather extremely impervious. Particularly nice as a gift. Colour: Brown. Measures 9.5 x 6.5 x 1cm (3.7" x 2.6" x 0.4") (L x W x H). Weighs approx. 26g (0.9 oz).